The roast. The pinnacle of the Christmas table but far too often a source of angst. 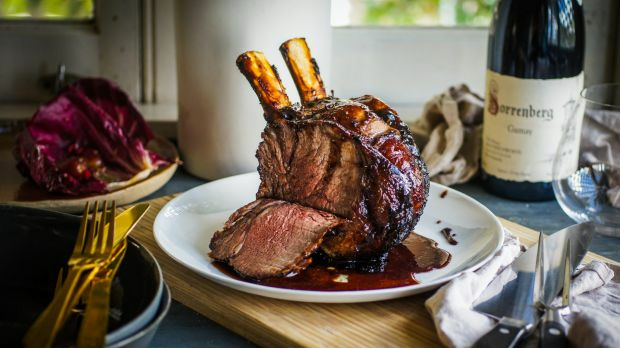 These roasts require a bit of prepping but the cooking is incredibly straightforward, leaving you free to don the paper hats and drink too much champagne rather than toil in the kitchen. Crunchy, salty, sweet and fatty – this is easily the dish to help you endure the third cousins and annoying uncle if required. If you can't track down saltbush, samphire is a decent substitute. This makes about 3 cups of plum and pinot sauce but it will keep in the fridge for 3 months in a tightly sealed container and is glorious on pretty much anything roasted, leftover sandwiches, dregs of ham etc. Feel free to swap tinned plums for fresh, just watch as it cooks as the sugar content may vary. 3. While the pork is cooking, add the plum and pinot sauce ingredients to a medium saucepan and place over high heat. Bring to the boil and once actively bubbling, reduce the heat to low and simmer, stirring occasionally, for the same time as the pork is in the oven. Once it has reduced to a sticky but still runny texture (about half), remove from heat and allow to cool. Remove cinnamon and star anise, pour the sauce into a blender and pulse briefly – it shouldn't be completely smooth and uniform. Season and set aside until serving. 4. Remove the pork from the oven and carefully transfer to a chopping board. Place the lemon, garlic and onion into the roasting dish, and place the pork, skin-side-up over the lemon and onion pieces. Increase the oven temperature to 200C and return the pork to the oven for a further 30 minutes. Rest the meat for 10 minutes, reserving 1 to 2 tablespoons of the fat from the roasting pan. 5. Pick 3 to 4 tablespoons of saltbush leaves. Working quickly, add the reserved pork fat to a frypan and place over high heat. Add the picked saltbush leaves and stir-fry for about 45 seconds – you want to coat the leaves in fat and for them to soften slightly. 6. Layer a few stalks of saltbush onto a serving platter. Place the pork on the saltbush and season generously with salt. 7. 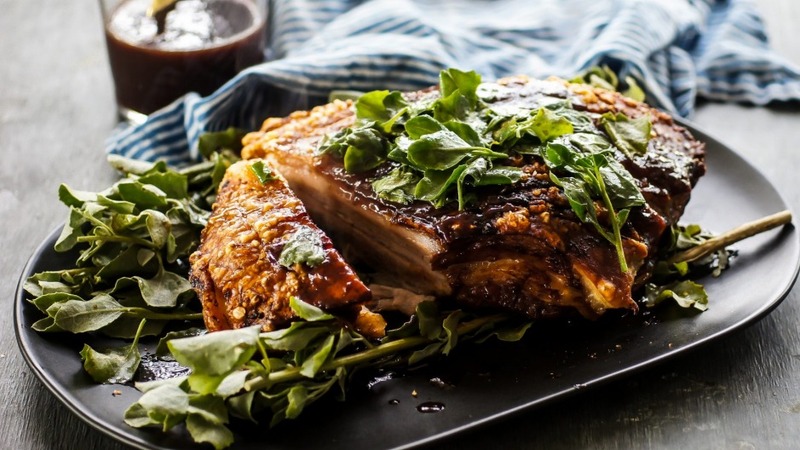 Spoon the plum and pinot sauce over the pork and top with the stir-fried saltbush leaves. Serve immediately. Start this recipe one day ahead. It's a gamechanger come Christmas Day – just bring the meat to room temperature then shove it in the oven. That's what Christmas is all about: minimal fuss, maximum impact and the greatest time possible with the people you love. 1. For the mulled wine marinade, add all ingredients to a medium saucepan and place over low-medium heat. Cook, stirring often, until the mixture takes on a sauce-like consistency and coats the back of the spoon. It should reduce by almost half. 2. In a large bowl or container, lightly brush the beef with olive oil. Pour over the marinade then cover and place in the fridge overnight. 3. Bring the beef to room temperature at least an hour before cooking. 5. Strain the beef from the marinade (reserving the marinade), shaking well as the sugar content will cause the sauce to burn so you don't want too much of it dripping all over your tray. 6. Stand the beef on a lightly oiled roasting pan then roast for 15 minutes to brown (don't run over time on this temperature setting or the marinade may burn). 7. Reduce heat to 180C and continue to roast, basting regularly with cooking juices and reserved marinade for 1¼ hours for rare. Continue roasting for 15-minute intervals until the beef is cooked to your liking. Rest for 10-15 minutes before plating and carving. 8. While the beef is resting, pour the reserved marinade into a saucepan and bring to the boil. The amount of remaining marinade may vary depending on how much basting you did during the cooking time. Boil for a few minutes, strain to remove the cloves, peel and cinnamon, then pour over the beef before serving, or serve on the side for guests to help themselves. 2. Cut the pumpkin into 10cm wide wedges, skin on, leaving the seeds. Rub over the oil, season with salt and pepper and place flat side down on a baking tray lined with baking paper. Roast until golden and soft (about 45 minutes), then reduce the heat to 160C and cook for another 20 minutes until the pumpkin begins to caramelise. 3. 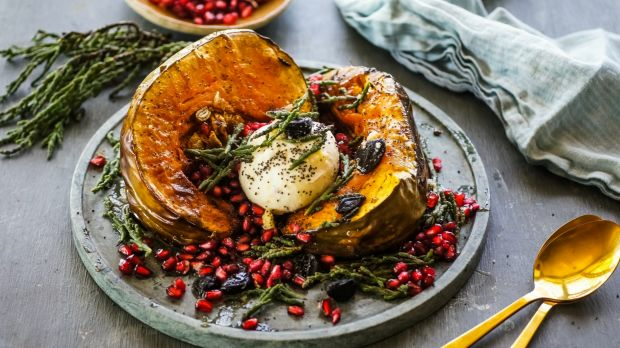 While the pumpkin is cooking, combine the dressing ingredients in a bowl. 4. To serve, place the pumpkin on a serving plate. Top with the ball of burrata and scatter over the pomegranate arils, black garlic cloves and samphire. Drizzle with dressing and season with salt and pepper. *Native succulent samphire is available from snowyriverstation.com.au, flowerdalefarm.com.au and outbackpridefresh.com.au. This salmon is impressive as a main dish but works just as well on a midweek portion of fish. 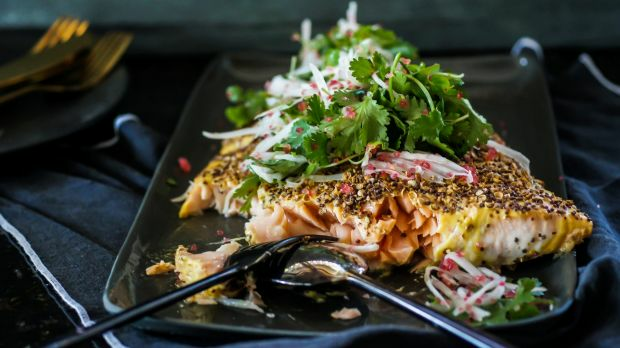 The sweetness of the mustard and the salmon is offset by the kohlrabi and finger lime, keeping it light and fresh. Perfect for any summer spread. 1. Combine the mustard, garlic and olive oil in a small bowl. 2. Place a large piece of foil, about 10cm longer than the salmon, onto a large oven tray. Carefully transfer the salmon onto the foil and rub over the mustard, garlic and oil mixture. 3. Add the coriander seeds and mustard seeds to a mortar and pestle and roughly crush until the coriander seeds are broken and fragrant. Gently push the crushed spices over the top of the salmon to create a crust. Cover with clingwrap and marinate in the fridge for four hours or overnight. 4. Allow the salmon to come to room temperature. Preheat oven to 200C. 5. Bake the salmon in the oven for 20 to 25 minutes for medium rare. (If your fish appears to be taking on too much colour, cover with foil and continue to cook, removing the foil for the last 3 minutes of cooking). Remove and rest, loosely covered with foil, for 10 minutes. 6. While the salmon is cooking, combine the salad ingredients in a bowl – use your hands to toss gently to coat in the oil and mustard. 7. To serve, carefully place salmon onto a large platter, season with salt and pepper and arrange small handfuls of salad down the centre of the fish.